Our motto is Building Careers One Student at a Time. We offer our students the highest quality academic courses, as well as the opportunity to obtain the highest level of career and technical training in one of our fifteen programs. Our graduates have the option of entering the workforce directly after high school, or continuing their education in at a post-secondary level. 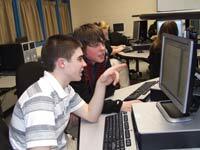 In addition, they have the opportunity to earn college credits or advanced placement through our tech-prep option. In addition to excellent academic and career and technical training, our students also receive the guidance and support necessary to direct them through their high school careers. Our guidance counselor, Mr. Jerry Ogurkis, is always available to assist students and confer with parents when necessary.